Celebrate national Cheese Soufflé Day, and put your empty coffee cup to good use, with this easy & delicious Cheese Soufflé! Set the oven rack about a 3rd up from the bottom of the oven and preheat to 400°F. Butter the insides of the coffee mugs and sprinkle in even amounts of the Parmesan cheese (1/2 in one and ½ in the other), tilting and shaking to spread the cheese out to coat as much of the inside of the mugs as possible. Over medium-low heat, warm the milk in a heavy saucepan until it starts to steam. While you’re warming the milk, melt over medium heat the 1¼ tbsp butter in a heavy saucepan. Then add the flour and whisk until it begins to foam. Remove it from the heat for about 1 minute. Pour in the warmed milk and whisk until smooth. Then return to medium heat and constantly whisk until the mixture becomes very thick (almost to the thickness of icing but not quite). Remove from heat. Whisk in the paprika, salt, and nutmeg. Blend in the egg yolks with a whisk, one at a time. Scrape the mixture into a medium-large bowl, cover it, and let it cool to be lukewarm or room temperature. Beat the egg whites in a separate bowl until stiff but still with softer peaks (not too dry). Fold ¼ of the egg whites into the cooled mixture. Then fold in half of what’s left of the egg whites while sprinkling in half of the Gruyére cheese. Then fold in the remainder of the egg whites while sprinkling in the remainder of the Gruyére cheese. Pour half of the batter into each prepared coffee mug. Place the mugs on a baking sheet and place it all in the oven. Lower the heat to 375°F immediately. Bake for at least 18 minutes before opening the oven door. 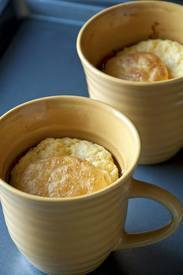 It’s done when the top is puffed and golden brown and the center jiggles just a little when the mug is lightly shaken. Serve it right away, but be sure not to set the hot mugs on a cold surface right out of the oven.